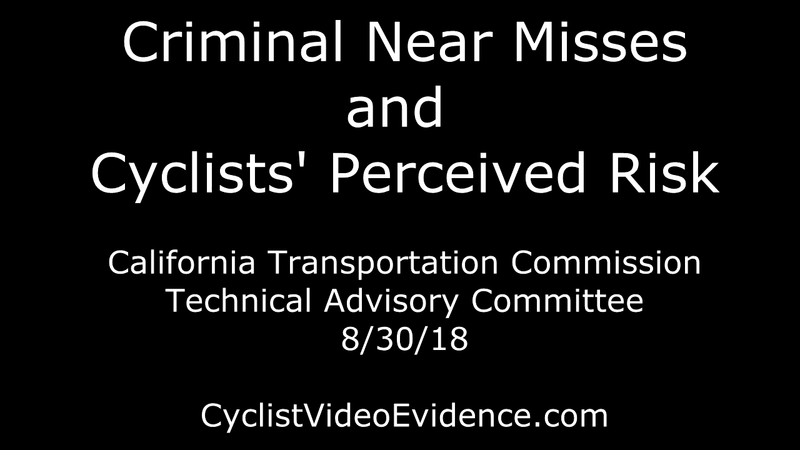 Matt Turner, Chair of the Alameda County Transportation Commission’s Bicycle Pedestrian Advisory Committee, and Craig Davis, Founder of www.CyclistVideoEvidence.com, will be presenting to the California Transportation Commission’s Technical Advisory Committee on “Criminal Near Miss Data for Inclusion in ATP Safety Scoring Rubric” this Thursday in Sacramento. Our goals are to share the importance of criminal near miss data (CNM) and to get the explicit inclusion of CNM data in ATP grant applications. As we previously posted, we were told that CNM data can be used in ATP grants but we believe it’s critical that CNM data is explicitly requested in the grant rubrics. Currently, only collision data is explicitly requested. We believe that collisions are a lagging indicator of safety: when a collision occurs it signifies the failure of all of the forces arrayed for public safety. We believe that criminal near misses are a leading safety indicator that can identify, educate and in some cases prosecute egregiously dangerous drivers, before collisions occur. We will also show this condensed version of our California cyclists’ video evidence of criminal near misses. We invite you to add your words of support and comments below. If you agree that our work helps increase cycling safety, please help back our work by donating. We are entirely donation and sponsor funded. As an veteran cyclist, I have experienced many near misses but no car/bike collisions so far. Near misses are what inform my behavior rather than collisions. Several times, these near misses made me reconsider cycling. But then I remember why I cycle (for health and environment) and get back on my bike. Since cycling is my main mode of transport, it is also my main source of exercise as I am too lazy to exercise otherwise. I know that my weight and cholesterol would increase without exercise since I have experienced that in the past. I am glad to hear the California Transportation Commission is considering near miss data to inform street design since road users already use near miss experiences to to inform their decision to ride or not. Let’s use near miss data to make our streets safer, thereby increasing cycling mode share. With way too many distracted, incompetent, and hostile motorists out there, my bike camera documents the dangers we cyclists face. It’s easy to save the videos for a lasting record of mishaps. We completely agree Will, and there is much more cyclists can do for their personal safety and the safety of all vulnerable road users. By entering criminal near miss incidents into our free Incident Management System cyclists can also analyze, track, update, and map their incidents as well as search for repeat offenders. This also provides criminal near miss data for government agencies and law enforcement to understand the real and perceived risks cyclists face cycling on the roads. These risks are the top reasons cyclists stop cycling and potential cyclists don’t start cycling. Government agencies and law enforcement need to understand these risks from cyclists’ perspective if they are serious about mode shift and active transportation. Criminal near miss data can also be used for grants to improve road safety before collisions occur.